A few weeks ago I did a review for The Christmas Boutique and one of the items they sent me was an adorable wall mountable moose head which I thought was fun and quirky. If you thought the same then it's your lucky day because The Christmas Boutique have kindly offered up three moose heads as a prize to one lucky reader. To enter the competition simply complete as many of the steps as you wish on the Rafflecopter form below. A winner will be chosen at random at the end of the competition. 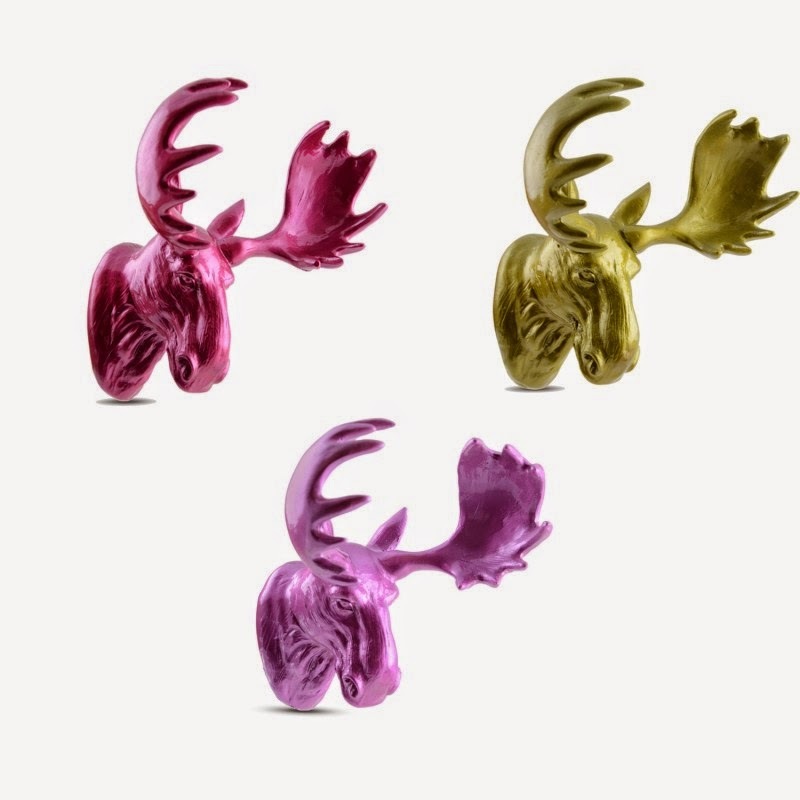 The prize is three moose heads, one of each colour; green, magenta and pink. The competition is open to residents of the UK only. Good Luck. The white fluffy feathered owls. I really like the red pine cone baubles, they'd look great on the tree. Cute Terracotta Father Christmas with Stocking Ornament http://www.thechristmasboutique.co.uk/christmas-ornaments/terracotta-father-christmas-ornament.html is my favourite. I love their range of Doormats - I always love to have a Christmas doormat each year and they have a superb range! http://www.thechristmasboutique.co.uk/christmas-doormats - everyone should have a Christmas mat!! The red glass pine cone baubles are lovely. The black finish metal tealight holders. These would make an hilarious xmas pressie for my friend! The large aluminium stag's head-love it. The moose heads are amazing, a great way to add some colour into christmas decorations instead of the usual red and green! I love the wooden reindeer advent calender. The purple glitter wreaths are gorgeous, I'd have those up all year round LOL! I love these stag heads but also the traditional look metal and glass lantern. I love the Wooden Fireplace & Father Christmas Advent Calendar In Red & White Finish. It would be nice to put a little treat of my choosing in the drawers for Samuel. I am sure I would get this out every year, so it has long lasting appeal. Better than the chocolate cardboard ones you get in the shops. Lots of lovely things but I think my favourite is the Wooden Christmas Advent Calendar Reindeer Head With Felt Numbered Bags. Small Plush Louie Bear with Winter Hat & Scarf is my favourite. Wood & Glass Christmas Lantern Available In Green & Burgundy; love them. I collect anything with owls, so it would be the fluffy, white birds. Stags head napkin rings are great. I like the stag's head cork bottle topper. Not that bottles remain empty long at Christmas time. The wooden lyric signs are great. Large fabric christmas tree advent calender! Oh that website is dangerous... I love so much! Contemporary Free Standing Aluminium Stag Deer Ornament It looks so awesome. I love the moose heads!!! Super selection, love the Metallic Dog decorations. The moose heads are actually my favourite! But I also love the Home Sweet Home Airmail Doormat - http://www.thechristmasboutique.co.uk/home-accessories/air-mail-design-door-mat.html - so cool! How could you not pick the moose heads! I love the aluminium stag heads but the moose heads are even cooler! the aluminium stag, to match my stags head above my fireplace! Soft Brown Teddy Bear Fabric Draught Excluder practical and a bear, what could be better! I love the Wooden Wall Mountable Stag's Deer Head Blackboard- what a great place to write our christmas holiday shopping list!!! The Contemporary Free Standing Aluminium Stag Deer Ornament is gorgeous! The moose heads! By far my favourite! The Set of Four Heart Shaped Glass Christmas Baubles In Red With White Glitter Spots would look lovely on my tree. Christmas Moose, interesting talking point during the sweet course!! definately the moose heads, they are brilliant! i like the Contemporary Free Standing Aluminium Stag Deer Ornament. Set of two hanging red reindeer ornaments look quite frisky. I love the large wall-mountable stag's head ornament in aluminium £79.99. I think the teddy bear draught excluder is brilliant. I love the Wooden Wall Mountable Stag's Deer Head Blackboard! Large 'Frohe Weihnachten' 'Merry Christmas' Linen Present or Gift Sack.